The great debate about hardwired versus wireless systems will no doubt continue for some years to come, but its clear that wireless access control is coming into its own. Hi-Tech Security Solutions asked a couple of industry specialists for their take on the benefits of wireless technology. Wendy Dodd of Axxess Digital Systems says that the case for wireless access control is overwhelming when you consider the benefits offered. There is a reduction in cabling and installation costs, leading to an overall reduction in cost of ownership, which allows for more installations in more locations than with wired systems. Added to this is the fact that not only do users have remote control capability, but handheld mobile readers can be used in applications where a wired system is not suitable. From a practicality perspective, installation procedures are faster and more simplified, and there is enhanced versatility in installations. Wireless allows users to consider controlling access areas that would otherwise be considered cost prohibitive. Wireless technology allows for retrofit convenience, especially in very old buildings. Some of the results of adopting wireless are a higher profit margin for installers and improved aesthetic control in high end properties, says Dodd. System reliability is obviously important and there are benefits and disadvantages to both wired and wireless technologies. Dodd points out that digital packet radio technology, together with SMART intelligent transmission of data, means that the wireless system is as reliable as a hardwired system. Certainly, a wireless system can be jammed by a high-powered broad spectrum jammer. However, these are illegal and not freely available. An intelligent system such as Axxess-E can detect jamming and can raise an alarm as well as email the condition to relevant people who can take corrective action. If jammed, this system does not become unreliable or unsafe, but rather it locks down everything and remains locked. Jamming cannot open doors, she adds. A further concern with hardwired systems is that the cabling can be eaten by rats or moles, can become corroded, flooded and even shorted. Third-party contractors can also negatively affect the system by inadvertently damaging cables in a large building whilst, for example, undertaking unrelated civil work. There are some hardwired readers in the field that can be easily opened, allowing for tampering with wires, effectively bypassing the access control system. Conversely, since all data in wireless systems like Axxess-E is encrypted with AES-128 encryption and a rolling code, there is no risk of external interference and destruction, says Dodd. Is a move to wireless access control not just a case of throwing the baby out with the bathwater? Gavin de Kock from MiRO says that IP technology has been around for some time now and wireless technology, in the form of Wi-Fi, has advanced to a point where it can provide communication between devices over far greater distances than with traditional cabling. This delivers a stable platform to not only efficiently offer excellent video footage and sound quality, but also allows one to prioritise between the two feeds. Another win with wireless systems is that all new systems embrace and employ IP protocols in one form or another. IP is essential for integrating disparate systems. IP is a global standard on which all Internet communications are based. Any IP-based system will allow communication over the Internet, making it very easy to centrally monitor different IP devices, whereas with traditional RS-485 and other protocols this was not possible, says Marco de Ru, MiROs CTO. 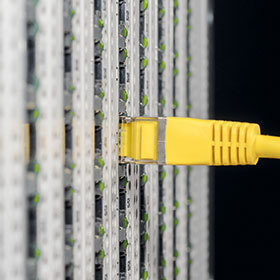 IP-based systems also offer a more future-proof solution and allow companies to use their existing LAN or WLAN infrastructure to connect and integrate their IP access control or time and attendance system without having to roll out new cabling. Due to the rapid development of the technology, prices are also being driven down through economies of scale, he continues. So you are considering a move or partial move to wireless. Should you simply add some wireless functionality onto your existing wired access system or do you need to replace your wired system with wireless to ensure a seamless transition? Dodd believes that the global trend is a rapid move towards wireless technology. Retrofitting high-profile openings with wired access control devices has always been costly and labour intensive. Additional challenges, such as retrofitting a fire-rated door, can also be troublesome. Modern buildings make ever more use of glass and solid concrete as opposed to dry wall structures. Aesthetics is also viewed with increasing importance in modern buildings, thereby making it increasingly difficult to run cabled devices. Wireless systems such as AXXESS-E E have various interface devices that enable the use of older wired devices by incorporating them within a new upgraded solution. This integration, as with the installation of a new wireless system, is easier than having to change an entire hardwired RS-485 system to a newer hardwired IP system, she says. Wireless will continue to grow in popularity, especially on large sites and in remote areas where infrastructure is not properly developed or where retrofitting is not an option in existing applications. Wireless is here to stay but it is often not necessary to completely ditch your legacy wired system. The bottom line is that the two technologies can coexist very synergistically for the foreseeable future and each application needs to be assessed on its own merit.